Brewing Bitter New Englander for NHC’s club night. This beer is going to be my contribution to club night for the National Homebrewers Conference. While I won’t be there, I’m really excited to be sending this beer for my peers. It will be one of many being poured by my club members at the Brew Free or Die (BFD) booth, just look for the old man of the mountain. Since this beer is representing New England at NHC, I wanted to use a recipe that inclues New England sourced ingredients. I started with the Brew Your Own bitter american clone recipe, and used 50% local grain sourced from Valley Malt, 50% local hops (http://www.oceanstatehops.com/ and http://fourstarfarms.com/), and locally sourced yeast. I brewed the Bitter American clone as my first all grain batch back in mid December. That attempt was all over the place, missed mash temps, stuck sparges, and extremely low volumes run off volumes to and from kettle. Despite all the challenges the resulting beer was enjoyable. 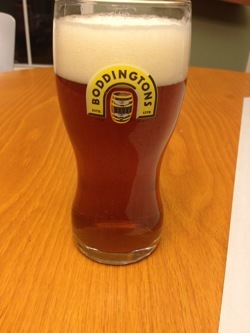 I felt if it was still good when i screwed up, it might be really good if I brewed it properly. I approached this brew night with a little extra pressure, and made an extra effort to execute this batch correctly. I couldn’t have asked for a smoother brew night. I came into the evening with the right mindset, and the goal to not to rush things. Despite having to get this beer brewed under a tight timeline, I didn’t let that pressure force my hand. It was a friday night, if I had a late night I would still have the rest of the weekend to catch up on sleep. There is no need to rush and make avoidable mistakes. I started off on the wrong foot, and over shoot my strike water temp, but leisurely, I waited and stirred until it was the right temp. I mashed in less than a half a point (157.2) below my targeted mash temp 158. I mashed for 45 minutes, and batch sparged. No issues with the sparge for this beer, I hit my run off total of just over 10g, and my target gravity. I tried something new for me, and first wort hopped this beer. My boil kettle is 10.5g, being that full it, meant it needed to be very closely watched to avoid boil overs. I stirred and skimmed until I could get the foam and boiling under control. With 20 minutes left to boil, I topped up the kettle to 10 gallons again with filtered water, and added my immersion chiller. You can tell from the picture there isn’t much room left. 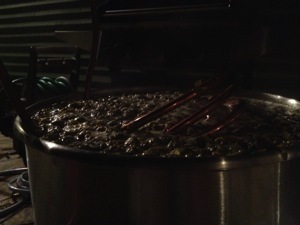 I finished boiling, added a big late dose of whole centennial hops at 0, and immediately chilled. I did not opt for the whirlpool regimen I used for the Heady topper clone, if I brew this beer again It’s a no brainer. I’m kicking myself now for skipping it. I chilled to 63 and took a original gravity reading, 1.045. Dead on target. I hit my target run off volume of 9 gallons, I filled both a 3 gallon carboy and a 6g carboy. The 3g batch got a full packet of safale us-05 after 20 minutes of aeration. The 6g got the same aeration time, but a decanted 2l liter starter of Conan yeast. Once transferred and pitched I placed the 6g into a water bath for temp control. I did say this was the smoothest brew day, I did not say this was the smoothest fermentations. There was not enough room in the water bath for the 3g carboy, so that remained at ambient basement temperature (60*). Within hours the 6g carboy, which was filled very highly was blowing off very vigorously. The 3g also had a nice amount of frothy yeast cap, and signs of fermentation. In a few short days fermentation seemed to have stopped in both carboys. I figured for a 1.045 beer, both of which were effectively over pitched, they were potentially done. This is where things went a little sideways, thank goodness I was able to make an adjustment to get things on track again. It seemed all air lock activity had stopped, and both beers had their yeast flock out. I was on a short time frame with these beers, so I was eager to get these beers transferred and dry hopped. 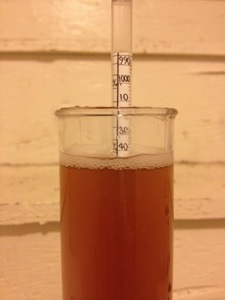 When I transferred the beer to secondary, I took a gravity reading. I was shocked to find both carboys were stalled at 1.020. I quickly consulted my inner circle of homebrewing friends. The consensus was that I might have a made a wort with very low fermentability. Alternate ideas were under aeration / yeast health. I was perplexed, I hit my target mash temps, and times, I over pitched both yeasts, and I made a yeast starter. Could my thermometer be that far off? One suggestion was to raise the temp of the beers to restart fermentation. Knowing one was already being warmed, I found a solution where I could raise the temps for both carboys. Once I warmed the 3g carboy things started bubbling away again. I initially suspected out gassing, but it persisted over a day, far too long for that to be the case. 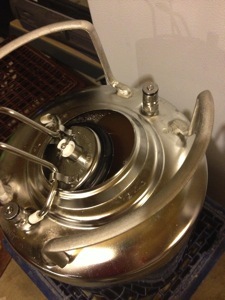 I decided to transfer the actively fermenting yeast slurry from the bottom of that carboy to the stalled 6g carboy. Using a sanitized auto siphon, I was able to transfer about a pint or more. The fermentation restarted in no time flat. After another 4-5 days, both carboys were down to 1.015. An FG I am satisfied with after seeing 1.020. I transfered 7.5 gallons to kegs. The aroma from the dry hop when washing out the carboys was amazing. As of Friday the NHC bound keg has been delivered, a 2.5g keg is carbonating in my keggerator. Printing a brew log, and doing the calculations on it. The False bottom separated the whole hops from the wort extremely well. Go back to original recipe. I made some recipe changes that are beyond my expertise. 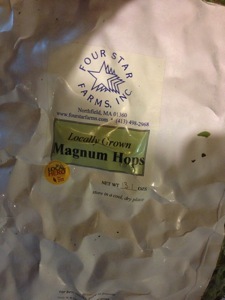 Whirlpool late addition hops for hoppy styles. Work on my temperature control for fermentation. Reconsider the timing of my yeast starters. Oxygen. I purchased a regulator, to replace the air pump. Manually recirculate wort to prevent trub and cold break transfer into the carboy. This beer will be served along side 3 Samuel Adams Patriot Homebrew Competition award winners and 16 other top notch beer at NHC Club Night Friday night 8pm-12pm at the Brew Free or Die club booth, and Saturday in Franklin hall for social club. If anyone gives it try, I’d love to hear your feedback in the comment section below.